In the second most famous scene from the 1999 film American Beauty, the Burnham’s teenage next-door neighbor, Ricky Fitts, an aspiring filmmaker, shows young Jane Burnham a work in progress. “Do you want to see the most beautiful thing I’ve ever filmed?” he asks, sitting down next to her on the couch in front of a television monitor. The subject of Fitts’s sublime filmic masterpiece is completely unexpected; his handheld video camera follows a piece of trash—a small white plastic bag, the kind one gets at the corner store to carry toothpaste home in—caught in a wind twister. 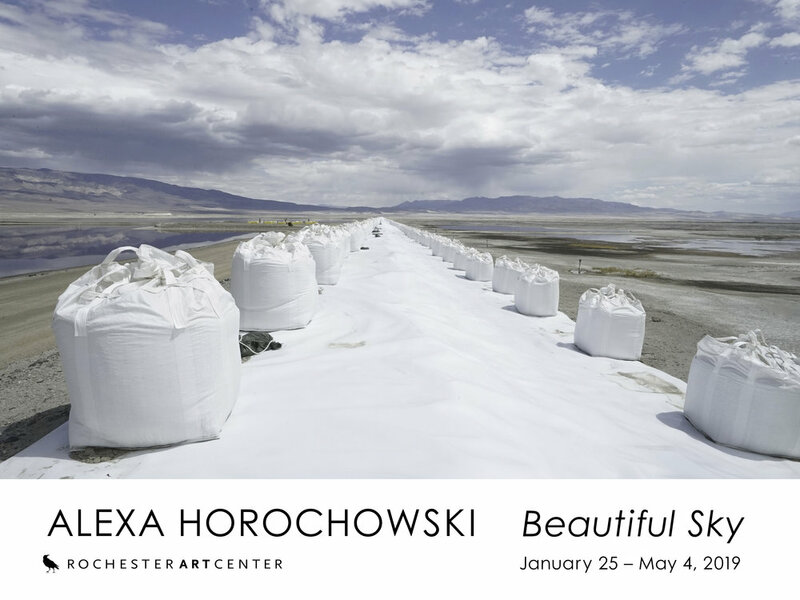 For her exhibition at Highpoint, Alexa Horochowski gathered together items not unlike Fitts’s plastic bag—polystyrene cups and packing peanuts, aluminum cans and plastic bottles. After coating them with different materials, including graphite, linseed oil (to render the former slick and sticky), turpentine, and oil stick, the artist placed them on horizontal planes of support (again, in differing materials, notably including Tyvek, itself an uber-plastic, manufactured en masse in China). Aiming huge industrial fans at the momentarily blank canvases, Horochowski, in turning them on, began the process of composition. The strong wind coming from all directions created a kind of wind tunnel, a “vortex” (a word that also serves as the series title). Each material behaved differently according to its material composition and weight. The nearly weightless packing peanuts, for instance, jump and bounce, much like popcorn, skipping across and around, leaving light, airy traces that nonetheless, when given time to accumulate, begin to construct a dense layer of webbed pigment. The plastic bottles, aluminum cans, and polystyrene cups result in very different, yet affiliated arcing shapes and movements. It’s easy—and even recommended—to look at the “Vortex Drawings” without immediately considering which source created each of them. Lyrical and surprising, though there is a kind of formula in how they are made, there are nonetheless no lack of visual and aesthetic surprises that result. Similar to, say, precedents like Robert Rauschenberg’s 1953 Automobile Tire Print (made by way of driving a paint-soaked tire over a long scroll of paper), the “Vortex Drawings” invoke aspects of the indexical. Yet, unlike that earlier work, which challenged ideas of high and low, and pressured concepts of genius, Horochowski’s re-invests in the way magic can appear in the strangest forms. She has long rescued items from their fates as detritus, not to dismiss the steady onset of ecological ruin but to insist that we see our own place within it, and sometimes a hint of beauty. Horochowski’s work is often discussed as overtly engaged in discussions around global tourism and industry. Her recent project, Club Disminución, for instance, was made in Chile, and brought together elements of the natural landscape (most notably the abundant cochayuyo, or Antarctic Kelp, found in the area) with the social and economic conditions of the local context. Here, the artist considered the ramifications around trade and exportation; yet, she focused, too, on the unwieldy material fact of the kelp itself. Symbolic in terms of its function as a commodity, the enormous seaweed was also represented in all its strange, surreal form: transported, dried, and reformed as sculptures, as well as filmed and projected in its native situ as moving image. For the artist’s presentation at Highpoint, she also presents a video, a seemingly straightforward, behind the scenes reveal that would ostensibly give viewers a tutorial on how the drawings hanging on the walls were made. Here are a group of polystyrene cups shot from above, shuddering into motion when a fan (out of view) is switched on. Yet, the resulting film does more than document some dumb material forms momentarily in motion. Instead, here is an oddly affective depiction of a moment in time—beings, not alive yet interacting, colliding, finding their way blindly across a surface that will come to bear the proof that they were there. And watching them, so were we. Johanna Burton is Keith Haring Director and Curator of Education and Public Engagement at the New Museum in New York and the series editor for the Critical Anthologies in Art and Culture. An art historian, a critic, and a curator, she has contributed to articles and reviews to numerous journals—including Artforum, Art Journal, October, and Texte zur Kunst—as well as to exhibition catalogs for institutions throughout the world. Alexa Horochowski, Kelp (Specimen Scan), 2014, ink-jet on substrate, 38 x 48".